C1648. CARL SCHURICHT Cond. 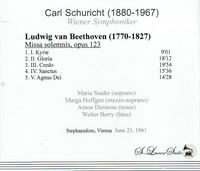 Vienna Phil., w. Maria Stader, Marga Hoffgen, Anton Dermota & Walter Berry: MISSA SOLEMNIS (Beethoven). [NB: there are two places in this recording - at 4:40 in track 3 (Credo) and 4:19 in Track 5 (Agnus Dei) where several bars are missing. The first appear to be a bad splice; in the second, the radio transmission was apparently lost.] (Canada) St Laurent Studio YSL T-511, Live Performance, 21 June, 1961, Stephansdom, Vienna. Transfers by Yves St Laurent. “If you can live with two momentary blips, there is much here to savor. 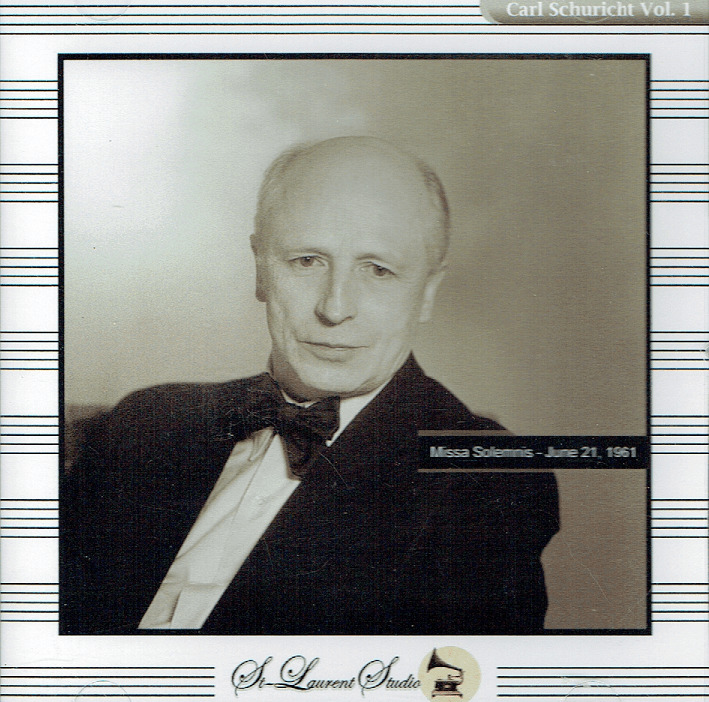 Schuricht did not have the opportunity to record the MISSA SOLEMNIS in the studio….Schuricht’s ‘take’ on the work is utterly unlike that of any other conductor I’ve ever heard. In his hands this intricate score, with its many dense contrapuntal passages, consistently emerges with the magical transparency, lightness, and intimacy of chamber music - and, unlike most period-instrument renditions, he accomplishes this without the results sounding at all underpowered and malnourished. Those same virtues are also present here in Vienna, though the reverberant acoustic of the mammoth St. Stephen’s Cathedral in Vienna makes them a degree less apparent. Even so, I was still surprised to hear immediately in the opening bars of the Kyrie instrumental details that I have not encountered in other recordings, and this feature remains apparent throughout the entire performance. Also, this is a brisk but by no means rushed performance with the pacing of each movement well shaped throughout all sub-sections; rarity of rarities, the always tricky final bars of the Agnus Dei for once sound like a definite and convincing conclusion to the whole, instead of the proceedings suddenly stopping in mid-course. 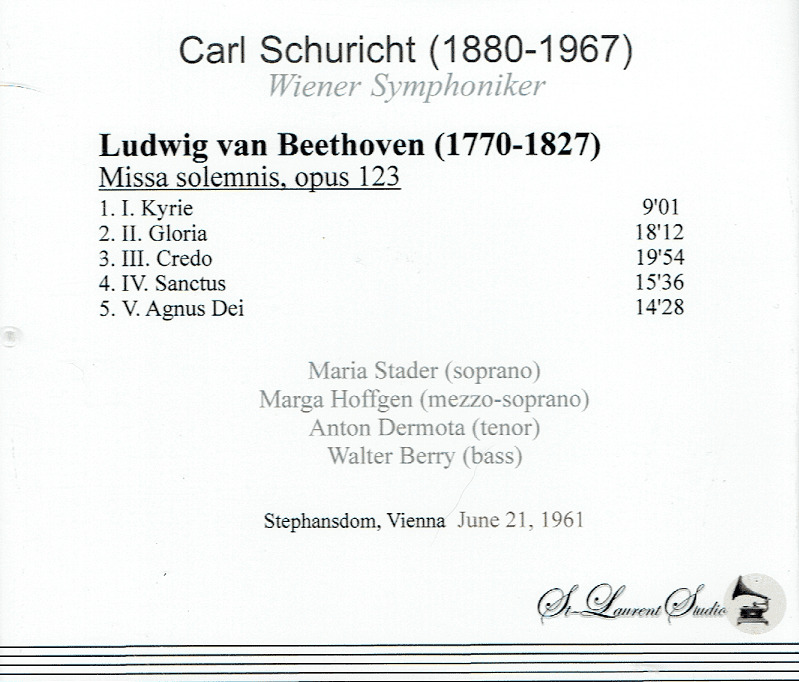 “Carl Schuricht was among the most distinguished German conductors of the inter- and post-War years. He studied composition with Engelbert Humperdinck at the Hochschule für Musik in Berlin, and then with Max Reger in Leipzig. He became music director in Wiesbaden in 1911 and elected to stay there until 1944. From this base he made frequent guest conducting appearances elsewhere and appeared at many summer music festivals. He was known for his interest in French music and other modern compositions, and frequently played music of Debussy, Ravel, Schönberg, and Stravinsky. He toured abroad often, and made his first U.S. appearance in 1927. For many years he conducted annual summer concert series in Scheveningen, Holland, a resort town next to the capital city, The Hague. In recognition of this, the Dutch government gave him the Order or Orange-Nassau in 1938. In 1942 he was appointed conductor of the Dresden Philharmonic Orchestra. He often opposed the Nazi government's policies, and in 1944 fled to Switzerland, where he resided thereafter. As many German conductors who had favored modern music in the inter-War years did, he settled firmly to the traditional symphonic repertory in the post-War years and thereafter became strongly associated with performances in the Romantic tradition, with rhythmic freedom and a smooth, beautiful and expressive sound.